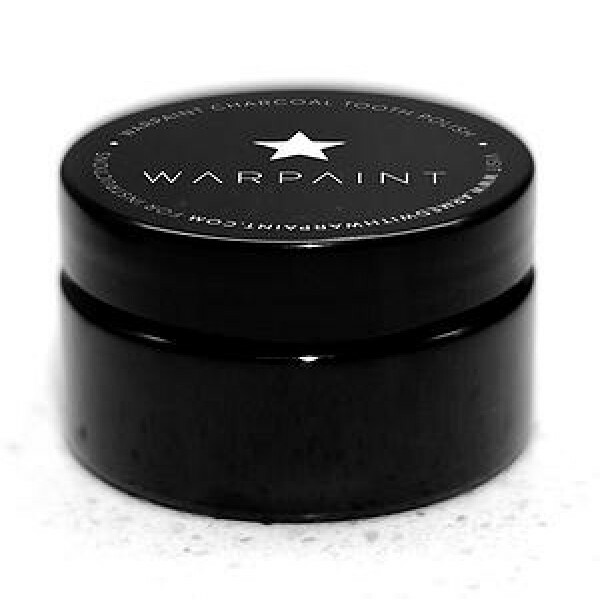 Warpaint Teeth Whitening | Shop Online NOW! All Natural and Organic activated charcoal teeth whitener. Charcoal and Clay teeth whiteners lift st.. This grimy little powder will whiten and polish your teeth with activated coconut shell charcoal. Brace yourself, because it's pitch black. It'll strengthen your gums, remove toxins from your mouth, absorb heavy metals and remineralise with bentonite clay, the organic sweet orange peel helps remove stubborn coffee stains. • We use australian edible calcium bentonite clay that remineralises and strengthens teeth. It is rich in vital minerals that are very beneficial for our teeth and gums – like calcium and potassium. It is a very mild abrasive clay that gently scrubs and beautifully polishes the teeth. Bentonite Clay has been used for decades as a treatment for numerous health conditions and acts as a detoxifying agent to help fight gum disease by strengthening the body's natural immunity. It works as an astringent by helping to remove tartar and cleans the gums. • We use a non abrasive very fine activated coconut charcoal (the food safe type that is used in emergency situations in the Emergency Room for overdoses of medications, drugs and alcohol), it adsorbs materials, it is very porous and this allows the surface of the charcoal to attract and hold material and debris within the pores. Brushing with activated charcoal will help remove discoloration, stains (coffee, tobacco, tea, etc.) and debris and leave the surface area of the tooth clean and appearance will be whiter. • We use organic sweet orange peel (does not contain citric acid), to remove stains and strengthen sensitive teeth. • We use organic lemon myrtle found on rainforest trees indigenous to Queensland, Australia, (does not contain citric acid), a powerful microbial and anti-fungal agent that also contains calmative properties to soothe and relax. • We use organic peppermint to reduce infections and inflammation. Plus, it'll keep you smelling fresh and zesty! How often can I use Warpaint? aftertaste. Some customer use it a few times a week, others use it daily. You can use it instead of your toothpaste. try WARPAINT on a little spot first to make sure or check with your dentist. WARPAINT ingredients are all natural, some organic. chemicals WARPAINT is the safest alternative there is. health professional, just for your peace of mind. How soon can you see results? WARPAINT is the safest alternative there is. WARPAINT is cruelty free and not tested on animals. give it a go, our users have great results. Are there any chemicals in the product? No, Warpaint is 100% natural. Gently brush for 2 Minutes, for extra whitening power you can leave it in your mouth for another few minutes before rinsing well. Can my kids use it? Yes, Warpaint is safe for kids of all ages. Yes, Warpaint is non-irritating, use a soft bristle toothbrush. Can it damage the enamel on my teeth? No, it will strengthen the enamel. Can it change the ph of my mouth? Yes, it can be helpful in changing the ph and health of your mouth, effectively killing the bad bacteria present in tooth decay and gingivitis. Can I use Warpaint for Oil Pulling? Yes, it is perfect. Add 1 tablespoon coconut oil to 1/4 teaspoon of Warpaint. Swish in your mouth for about 10 - 15 minutes. Rinse thoroughly. You can use this method several times a week. Can I use Warpaint as my daily toothpaste? We recommend you use your WarPaint as an add on like serum to your moisturizer. Does it stain my clothes? Yes, it stains eveything. Do not drop it! Have a dark washcloth by your sink! Seriously. Use as often as needed and don't inhale the powder.